Why Vision Tools MammoView ? The PACS Workstation of choice. Vision Tools MammoView is a powerful stand-alone Mammography PACS workstation for viewing, processing and managing mammography images from either digital mammography, CR converted studies or tomosynthesis . (FDA 510K cleared). 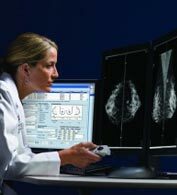 With its archiving capabilities, image viewing, hanging protocols, variety of processing tools, printing features and reporting, the Vision Tools MammoView application can be considered as an ideal solution for most doctors and users who need to increase their daily diagnosis productivity and also for women screening programs. Vision Tools MammoView suites almost all of the daily activities of any physician in a low cost of ownership and high content solution that is scalable to any organization. Stay up-to-date with MILLENSYS automatic updates feature that keeps the Vision Tools application updated to the latest version with new features and bug-fixes. Combining Vision Tools MammoView with MILLENSYS Cloud PACS "Vision Tools Workspace" decreases the diagnosing time through the powerful included tools leading to an increase the productivity of all the users dealing with PACS. Support of 5MP / 10MP medical monitors. Workflow based reporting including blind reading reporting methodology for mammography reporting. structured Reporting is a very important tool in doing statistical analysis specially for nation wide mammography screening project for early Brest cancer detection and prevention.